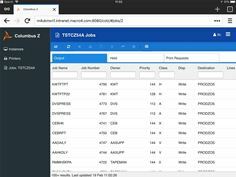 Crawley, UK, February 21, 2018 – Macro 4, a division of UNICOM® Global, has introduced a new web browser interface for Columbus Z, its output management solution for monitoring and controlling printing within the IBM z/OS mainframe environment. The new web front end, which is mobile compatible, boosts efficiency by allowing operations and helpdesk staff to manage their company’s mainframe printing infrastructure while off-site or on the move. It also provides a more intuitive alternative to the traditional 3270 mainframe display, with all the usability and productivity benefits of a graphical interface. Newcomers to the mainframe, who are unfamiliar with the 3270 ‘green screen’ command line view, or users seeking a modern alternative that requires less training, can take advantage of the additional features available in the new web interface, such as drop-down menus and pop-ups, that make navigating the system easier. It is also touchscreen enabled for use with mobile devices. “The web interface removes the need for any specific mainframe knowledge or training to work with Columbus Z: you can simply point and click your way around the system. This makes it much more accessible. Now anyone on your helpdesk team can respond to mainframe printing queries, rather than relying on mainframe experts – who are often thin on the ground,” added Banham. Columbus Z is an output management solution that allows users to send or print mainframe documents from the JES spool to any destination in a multi-platform systems landscape including z/Linux, Unix, IBM i and Windows. Columbus Z controls the z/OS mainframe output management environment to drive maximum value from an organization’s existing print infrastructure. Non-mainframe applications can make use of high-speed mainframe-attached printers, and vice versa: documents can be transferred off the mainframe to low-cost distributed printers. This approach minimizes the need for investment in new printer hardware. Seamless integration with the rest of Macro 4’s Columbus suite makes mainframe printing an integral part of any enterprise information management infrastructure.